The current 2018 Winter Olympics, held in PyeongChang, South Korea, led to a charm offensive by neighbouring North Korea, which included the reopening of a border hotline with the South, that had been closed for almost two years. The reopening came with new photos of the fancy-looking communications equipment, which will be described here, as well as the fact that there's not just one phone line, but over 40. 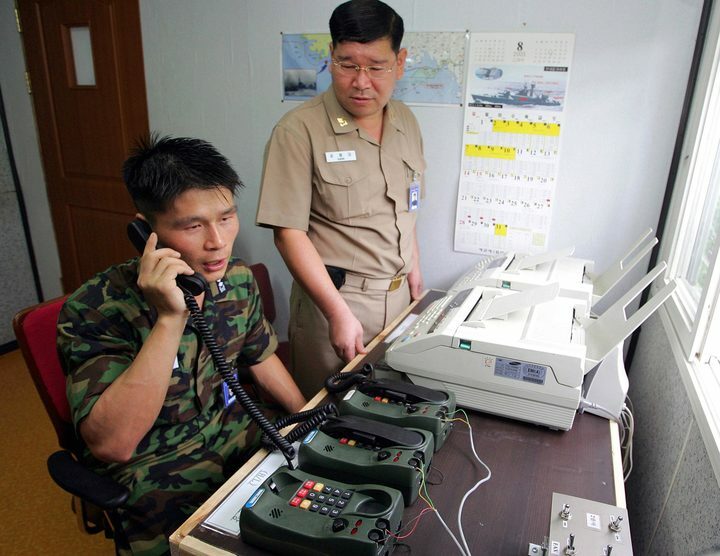 Unlike other hotlines, the ones between North and South Korea are mostly used for low-level practical issues. The first hotline between North and South Korea became operational on September 22, 1971. The link was the result of the first inter-Korean Red Cross meeting held on September 20, which resulted in an agreement to establish two lines for direct telephone calls between the two countries. 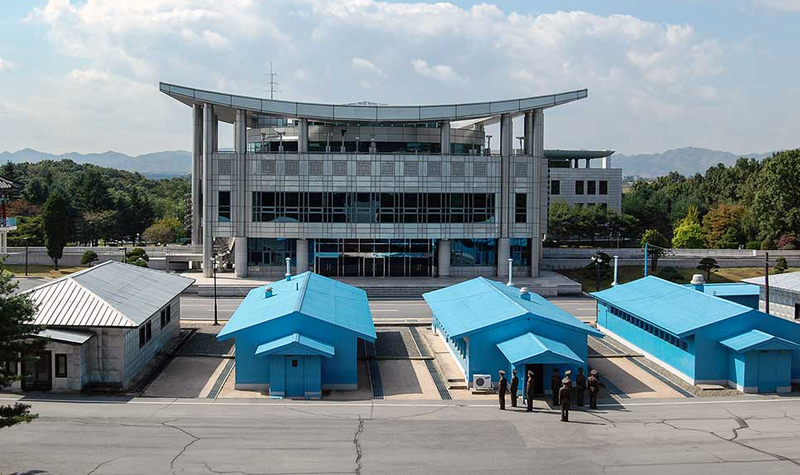 It was also agreed to construct a liaison office inside the Joint Security Area (JSA) of Panmunjom, which is in the heavily-fortified Demilitarized Zone (DMZ). The direct telephone link between the liaison offices is therefore often called the Red Cross or border hotline. On the South Korean side, the hotline equipment is located in the communication office on the second floor of the Freedom House, which was built in 1998. On the North side, the line ends at a desk in the Panmungak building, which is less than 100 meters (328 feet) away. 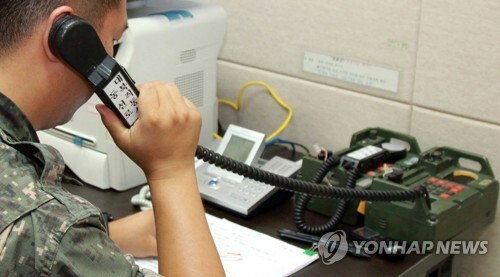 In the Panmunjom area, the hotlines connect the inter-Liaison Office, the inter-Korean Red Cross Talks Liaison Office and the Front Office of the inter-Korean Talks Headquarters. The current equipment, which is seen in the most recent photos, was installed in 2009 and consists of a large, wood-panelled console on a desk. On top is a sign that says "South-North Direct Telephone". The system features two disk drives, two sets of USB ports and one computer screen, which shows the Windows XP user interface. It's not clear what the function of the screen is, as there's no keyboard visible. Update: As noted on Twitter, the computer screen appears to show the user interface of a VoIP softphone client, maybe an ancient version of X-Lite, but that hasn't been confirmed yet. Probably this setup made it easier to have the calls recorded, for example by using the CD-stations. Most important parts are however two telephone handsets, one red and one green. The red one is for incoming calls from North Korea, while the South uses the green handset to make outgoing calls to the North. However, both phone sets are capable of sending and receiving, but there have been installed two of them just in case one fails. 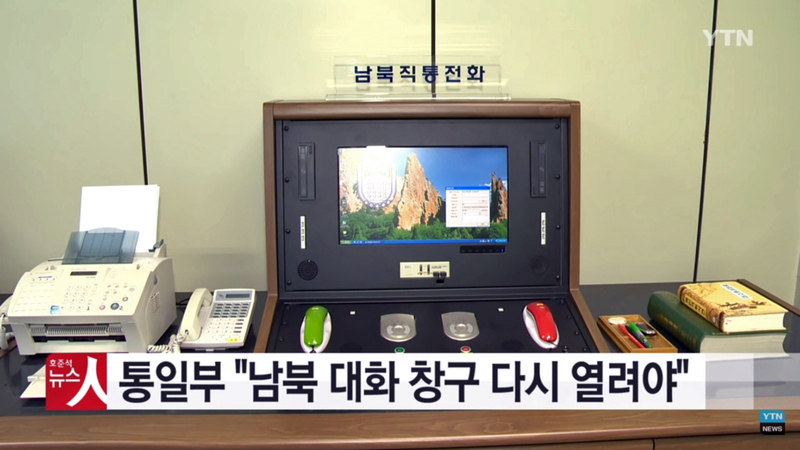 Since 2015, the console has two digital clocks on top, as in that year North Korea shifted to UTC+08:30 or Pyongyang Time (PYT), while South Korea stayed in the UTC+09:00 or Korea Standard Time (KST) zone. In the photo below, the green clock shows 3:34 for South Korea and the orange/red one 3:04 for North-Korea. 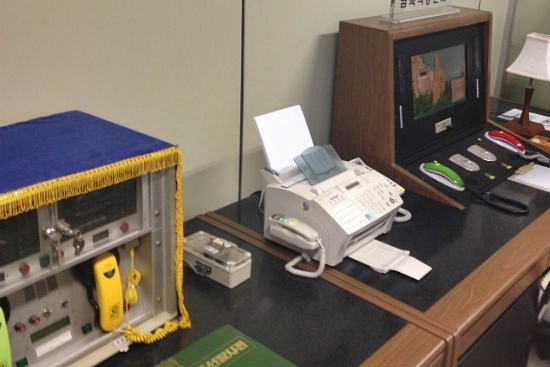 At the left of the hotline console there's a Samsung SF 530 fax machine through which North Korea sometimes sends messages about topics that range from logistics to threats. 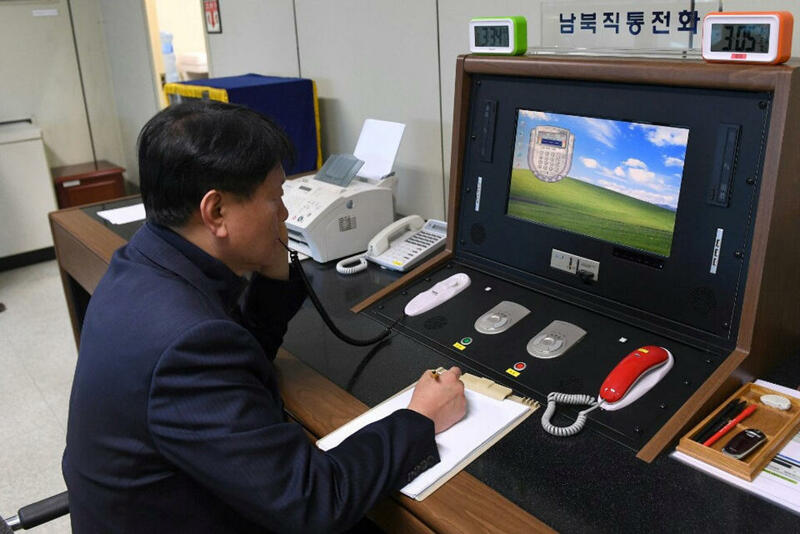 The hotline phones at the Inter-Korean Red Cross Liaison Office and the Inter-Korean Liaison Office on the South side are operated by officials from the Unification Ministry. They are experts in diplomatic protocol and have in the past played roles in face-to-face talks as well. To resolve the problem of who calls first, it was decided that the South calls the North on odd dates, while on even dates it's the other way around. The daily routine for weekdays is that communication officials make a phone call everyday at 9:00 AM and again at 4:00 PM. No routine calls are made on Monday morning, Saturdays and Sundays and on bilateral holidays, except for when there are special requests. The government can instruct to use the hotline for the exchange of official messages, which come in the form of a 'telephone notice' which means that a liaison officer calls the other side and reads a document carrying a proposal or official position on a proposal of the other side. All this is very similar to how the hotline between Washington and Moscow is operated, although that one is just for written communications. Finally, when a document with official seals has to be delivered to either North or South Korea, a call is made to arrange a face-to-face meeting at a certain time on the demarcation line. After the Red Cross border hotline at Panmunjom was established, more lines would follow. On April 29, 1972, a direct line between Seoul and Pyongyang was secretly set up to prepare the visit of high-ranking officials to Pyongyang. Following this visit, the director of the CIA contacted North Korean president Kim Il-sung and they agreed upon a direct telephone line for the Inter-Korean Control Committee. - 2 lines in Panmunjom for the Red Cross, since September 22, 1971. - 1 line between Seoul and Pyongyang to prepare a high-level visit, since April 29, 1972. - 20 lines between Seoul and Pyongyang for inter-Korean Red Cross talks, including 2 lines for the Central Red Cross Organisation, since August 18, 1972. - 1 line between Seoul and Pyongyang for economic talks, since December 20, 1984. 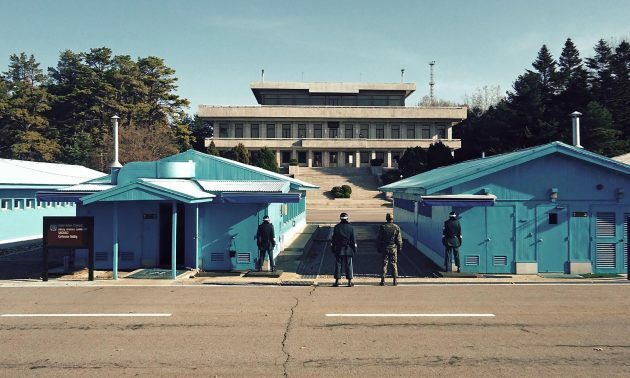 - 2 lines between the newly established inter-Korean Liaison Office in the Panmunjom Freedom House and the Panmokgak building for inter-agency business talks, since May 18, 1992. - 2 lines between Daegu (since September 18, 2001: Incheon) and Pyongyang for air traffic control, since November 19, 1997. - 2 lines between Seoul and Pyongyang for the inter-Korean Maritime Authority, since August 12, 2005. - 3 lines between Seoul and the Kaesong Industrial Complex for the inter-Korean Economic Cooperation Consultation Office, since November 1, 2005. 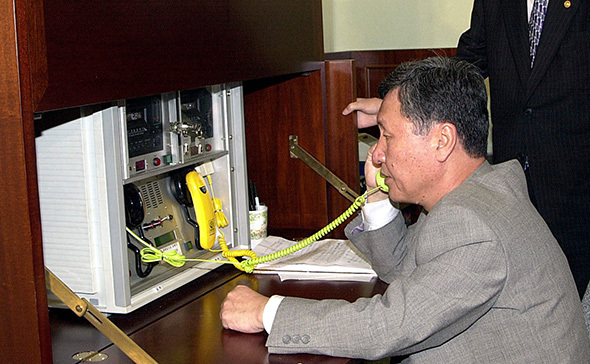 Several of these direct phone lines through Panmunjom have lost their original function, such as the one for economic talks, but these lines are now for example used as a fax line for communications between the North and South Korean Red Cross Liaison Office, which was opened on April 11, 2004. - 6 lines between military authorities for the Gyeongui Line, since August 15, 2005. - 6 lines between Dorasan Station in the South and Panmun Station in the North for the inter-Korean railroad, since May 14, 2007. Besides the aforementioned telephone ines, there are also several military hotlines. In accordance with bilateral agreements, a West Sea communications link was established in September 2002 and an East Sea link in December 2003, each consisting of a phone line, a reserve phone line and a fax line (these lines may well be identical with those for the Gyeongui and the Donghae Bukbu railroads respectively). at a military office near the Demilitarized Zone (DMZ) in 2005.
counterpart through a military hotline, September 6, 2013. On August 30, shortly after the Panmunjom ax attack, the hotline was shut down by the North. It was resumed on February 7, 1980 following a first working-level agreement to discuss the inter-Korean prime ministerial talks. North Korea unilaterally declared to cease contact on September 24. The hotline was reopened again on September 29, following an agreement with the North Korean Red Cross for consultation on North Korean flood assistance. The direct phone lines were aborted immediately after a North Korean submarine ran aground near Gangneung in the South in an attempted infiltration mission. Communications resumed on August 14, 2000 following the first agreement on inter-Korean ministerial talks. North Korea declared the hotline "disconnected" after Seoul proposed a resolution about human rights in North Korea during the General Assembly of the United Nations in November. Communications resumed on August 25, 2009 with the visit of President Kim Dae-jung's special envoy to Seoul and inter-Korean Red Cross talks. After the Cheonan incident, North Korea shut down all communications channels with the South on May 26. 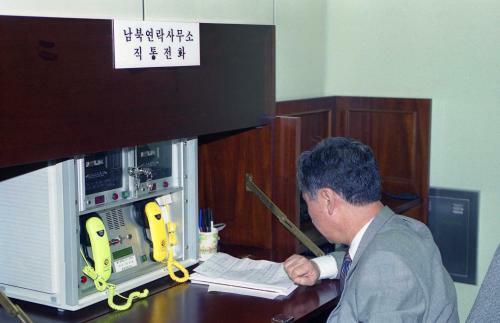 The air control phone line was re-established on October 18, 2010, while the lines at the inter-Korean Red Cross liaison office were reconnected on January 12, 2011. On March 11, North Korea had stopped responding to calls on the Red Cross hotlines and also shut down the communication line with the American military command in South Korea, as well as the military telephone and fax lines used to coordinate cross-border travel to the joint industrial park in Kaesong. The North connected the Red Cross hotline again on June 7. 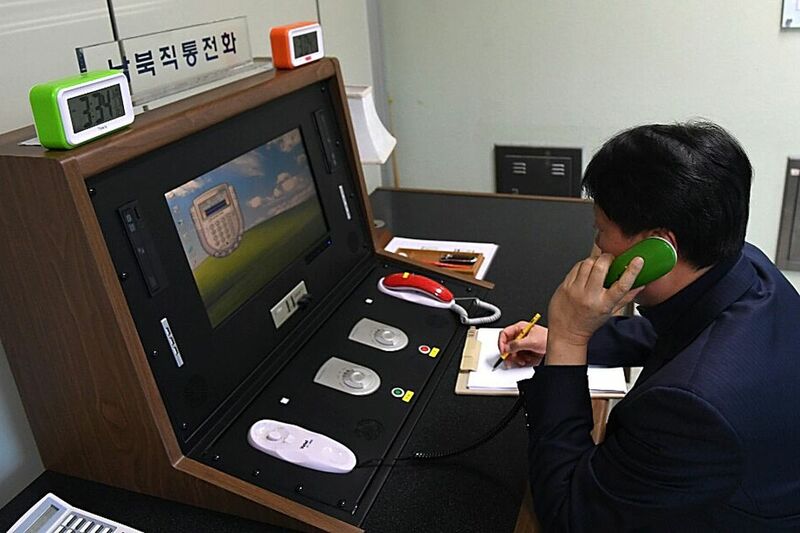 A hotline used by military officials regarding travels to Kaesong was restored on September 6, 2013. In February, Pyongyang stopped responding to South Korea's calls in the Panmunjom office after Seoul suspended a joint economic project at the Kaesong Industrial Complex over Pyongyang's nuclear tests. The military West Sea hotline was also closed, just like all other hotlines through Panmunjom, except for the two air traffic controle lines. On January 3, 2018, North Korean leader Kim Jong Un gave the order to reopen the Panmunjom border hotline at 3:00 PM local time. According to South Korea's Unification Ministry, the North Koreans made first contact at exactly the time ordered. Both sides were on the phone from 3:30 PM to 3:50 PM local time and during this initial 20-minute conversation, the two nations "checked technical issues of the communication line," according to a statement from South Korea's Unification Ministry. The Ministry said North Korea phoned for a second time several hours later, suggesting the two sides wrap up business for the day. Other than checking that the link was operational, it is unclear what was discussed. According to a ministry spokeswoman there was no mention of future talks or the Olympics. 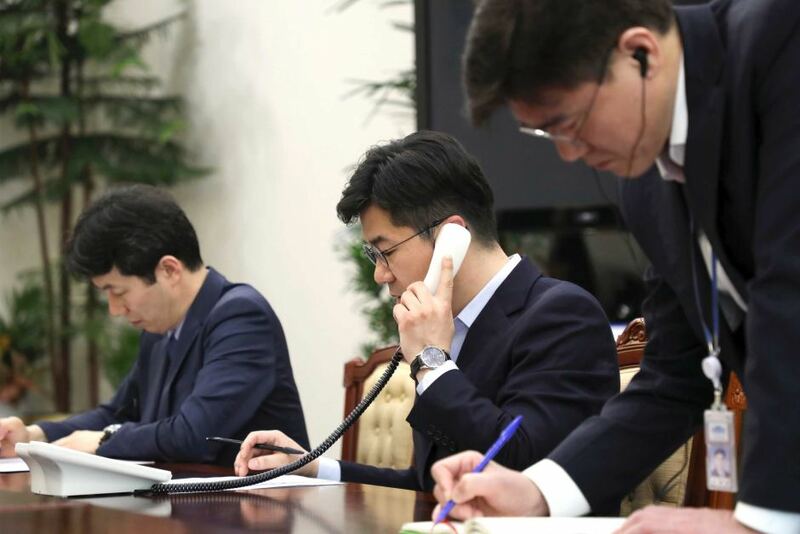 A top-level telephone hotline between the presidents of North and South Korea was established on April 20, 2018, in preparation of a summit between both leaders later that month in the border town of Panmunjum. Before this meeting, both presidents are expected to have a talk over the phone, but no date has been set for the call. 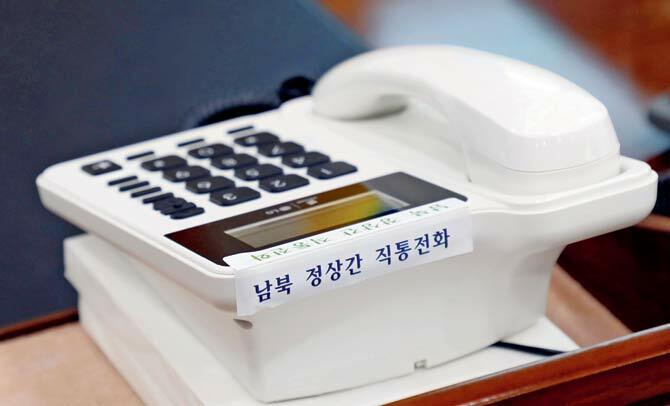 According to the Yonhap news agency, the new hotline connects the desk of South Korean president Moon Jae-in at the presidential Blue House with North Korea's State Affairs Commission, which is headed by Kim Jong-un. South Korean officials were the first to pick up the phone, then took a return call from their North Korean counterparts to make sure the line was working in both directions. Thank you for making these very in depth and interesting posts. Lots of really good information and research on this site. Now if I may ask, and I know that this topic may be outside the scope of this site, but do you intend to every cover the CIA side of SIGINT/cyber in the same way you covered the NSA's SIGINT and cyber capabilities?